11:55 Hello everyone and welcome back to AUTOSPORT Live as we continue the story of round six in this year's FIA Formula 1 world championship - the Monaco Grand Prix from the streets of Monte Carlo. Nico Rosberg again started a race weekend positively by setting the pace in this morning's first 90-minute session, with a time of 1m16.195s. He was just under one-tenth clear of Fernando Alonso, with Romain Grosjean third, Felipe Massa fourth and Lewis Hamilton rounded out the top five with as deficit of 0.274s to his team-mate. Now the focus will switch from baseline set-up to tyres, as the teams and drivers work with both compounds, as well as running with varying fuel loads as they look ahead and prepare for Sunday's race. 11:56 Conditions remain unchanged and it is glorious around the principality for this afternoon's session. The light southerly breeze has picked up just a little from the Mediterranean, while air temperature has risen to a fine and almost summery 24 degrees Celsius. 11:57 After cleaning the surface in first practice, the second session gives teams a chance to test both allocated compounds - the soft and super-soft. Signification evolution of the grip levels can always be expected going into the weekend, as further racing rubber goes down on the streets that remain slippery after a year of ordinary motoring. Nevertheless, teams will be keen to get a read on the ultimate pace of the softest Pirelli tyres in both lighter fuel and race-ready trim. 0 min: Hulkenberg's Sauber is one of the first out. 1 min: Bottas and Vergne head out for an early run. 2 min: As per usual in this session, many of the drivers will complete between six and eight laps for this first run, straight out of the box. 3 min: Maldonado, Ricciardo and Sutil are all on the circuit in the sunshine. 3 min: And Gutierrez sets the first time at 1m24.850s. 3 min: Di Resta joins the throng on track and it's beginning to get a little busier. 4 min: Bottas registers his first time of the session. He goes third with 1m25.895s. 4 min: Hulkenberg and Bianchi have completed their first laps, but they are not quick ones. 4 min: Maldonado takes over at the front with 1m18.863s. 5 min: Vergne has slotted into third place with a time of 1m20.404s. 5 min: Maldonado continues on for another hot lap and he's hitting the ground running quickly here. 5 min: Raikkonen completes his first flyer, but he's only 10th at this stage. 5 min: Bottas takes over up top from his team-mate with a lap of 1m18.360s. 6 min: Rosberg and Hamilton are now on the circuit for Mercedes. No move from the Red Bull pair just yet. 6 min: Bianchiis now third on 1m19.315s, followed by Perez's McLaren in fourth. 7 min: Immediately replaced by Raikkonen at the top. 8 min: Ricciardo moves up the order to third spot with a time of 1m18.258s. 8 min: Sutil moves up to fourth with 1m17.858s in the Force India. 8 min: Grosjean pips his team-mate with the first sub-1m17 of the session, 1m16.999s. 8 min: Hamilton was looking quick in the first sector, but he made an error and locked up into Mirabeau. He recovered and has backed off. 9 min: Di Resta crosses the line and posts 1m17.337s and moves into third position. 9 min: But Rosberg now takes over at the front of the field with a time of 1m16.589s. 9 min: Button is currently 10th, a fraction down on Perez, who is often fast around Monaco. 10 min: This early group of drivers will be coming towards the end of their initial blast now, as Webber heads out in the Red Bull. 10 min: Massa goes second for Ferrari, as Grosjean goes fastest again 1m16.096s. 11 min: Hamilton managed to get a clear lap next time around and he has moved up the list to fourth position, with 1m16.675s. 11 min: Ferrari's Alonso has yet to set a time. 11 min: So the order is Grosjean up top, followed by Massa, Rosberg, Hamilton and Raikkonen after just 11 minutes. 12 min: He goes faster, but falls to second. 12 min: Webber is now into his first timed lap, as Rosberg comes over the line and goes fastest again with 1m15.843s. 13 min: Hamilton completes another tour and he makes it a Mercedes one-two with a lap of 1m15.963s. 13 min: At Red Bull, Vettel is ready to come out to play now. He climbs aboard the RB9. 13 min: Rosberg is back into the pits after a run of six laps in the Mercedes. 14 min: Alonso finally completes a lap and is fifth fastest, just ahead of Massa. 14 min: And now the lead Ferrari goes fastest, 1m15.519s. 15 min: Grosjean improves. He goes back to second. This is a promising run for the Lotus so far. 15 min: Button is now the fastest McLaren, in 7th, 1.2s down on Alonso. 17 min: In the fight at the back, Bianchi's Marussia is ahead of the two Caterhams of Pic and van der Garde, with Chilton two seconds down on his team-mate. 17 min: Webber has managed to get a quick lap on the board. He is into fifth spot with a time of 1m16.263s. 17 min: Vergne is on track and he is the first to use the super-soft compound. 18 min: Vergne moves into 11th spot with a time of 1m17.374s. 19 min: Bit of a lull with the frontrunners, so the order is Alonso-Grosjean-Rosberg-Hamilton-Webber. 19 min: Still no move from Vettel, while everyone else out has completed one run already. 19 min: Raikkonen is now out on the super-soft. 19 min: Vergne gets a second hot lap out of the super-soft tyre and moves into 10th with 1m17.184s. 20 min: Kimi goes sixth, finding a second over his previous best on the soft rubber. 20 min: Di Resta is back out for a second run, but he is using the same set of soft tyres that he was running previously. 21 min: Bianchi also out on the super-soft. 22 min: Bottas heads out to begin his second run, also using the soft prime tyre that he was running previously. 23 min: Vettel finally heads out onto the circuit, using soft tyres. 23 min: The German is into his first timed lap of the afternoon session, with the current benchmark being Alonso's 1m15.519s effort. 24 min: Vettel rounds Anthony Noghes corner and he posts 1m16.014s to slot in seventh. 24 min: Raikkonen goes fastest on the super-softs, with 1m15.511s. 24 min: Rosberg is now on track using the red-ringed super-soft tyre. 26 min: The supple suspension of the Lotus appears to be working well around the streets, currently first and third. 26 min: Rosberg is quickest of all in the first sector of the lap with 19.681s. 27 min: Another fastest sector for Rosberg and he crosses the line in 1m14.759s to take over at the head of the list. 27 min: Lewis Hamilton is also out there with the super-soft compound deployed and the Briton will be looking to join his team-mate at the front of the field. 28 min: Rosberg's effort is around 0.4s down on the lap Michael Schumacher managed in qualifying last year for Mercedes, before his grid penalty. 29 min: Bianchi has managed to split the Saubers and is currently 17th. 29 min: Vettel returns to the pits after a short run of five laps in the Red Bull. He is seventh in the classification. 29 min: After backing off for a couple of laps, Hamilton is now into a hot effort with the option tyres. 30 min: The Briton comes round and moves into second spot with 1m15.077s, making it a Mercedes one-two. 30 min: The gap between Rosberg and Hamilton is 0.318s, with Raikkonen third, Alonso fourth and Grosjean in fifth spot. 31 min: Grosjean is now out on the super-softs. Can he close the gap to the Mercedes duo. 32 min: No! He's crashed at the exit of St Devote. 32 min: The other drivers have reacted and many are heading for the pits. 33 min: He locked up and just ran wide into the barriers, ripping off the front-left wheel. 34 min: Webber is one of the last to return to the lane, with his team watching what is becoming a lengthy recovery process. 35 min: Grosjean's Lotus is now being lifted off the circuit, so hopefully everyone will be able to press on again soon. 36 min: Ricciardo heads out of the pits with super-soft tyres fitted to the Toro Rosso. 37 min: The session has been stopped. 38 min: Charlie Whiting has decided to red flag this one, soon after Grosjean's car had been lifted away from the Ste. Devote crash site. 39 min: Okay, we have local know-how attending to the kerbs at the high-speed swimming pool section. 39 min: Both Ferraris had to abandon their planned runs on the super-soft Pirelli. 39 min: The session will restart at 14:41 local time. 40 min: Two local tradesman superstars have repaired the kerb at the entry to the piscine and we will be underway again in less than one minute. 41 min: The session has restarted. 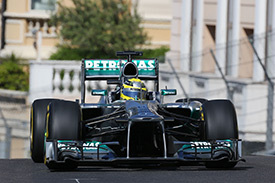 42 min: Rosberg, Webber, Sutil, Vergne, di Resta and Bottas are all quickly onto the circuit to resume their quick runs. 42 min: The kerb delay was due to a broken bolt that holds the kerbing down, but all sorted very quickly. 43 min: Only five drivers remaining in the pits now and many of them are keen to get these super-soft runs in, so that they can get a long run on high fuel towards the end of the session. 44 min: Di Resta improves on super-soft tyres with a lap of 1m16.411s. He moves up to ninth. 45 min: Button makes a quick stop to switch to super-softs while Alonso has a barrier-brushing moment. 45 min: Super-soft tyres for everyone except Vergne in the Toro Rosso at the moment. 46 min: Sutil improves with a time of 1m16.349s and he moves up the order to ninth position. 47 min: Di Resta takes ninth from his team-mate with a time of 1m16.046s. 47 min: Maldonado also has managed to improve and he is up to 14th with 1m16.857s. 47 min: Alonso sets a new best in sector 1 and again virtually kisses the barrier at the last corner to go third. 48 min: Webber and Vettel are on the circuit, both using the super-soft tyres. 49 min: Gutierrez improves to 15th and is around a tenth off Sauber team-mate Hulkenberg. 49 min: Webber has driven straight on at the chicane, before holding up Button rather badly. To rub salt into the wound, Webber then pitted at the end of the lap. 51 min: Perez back ahead of Button as the McLarens languish in 11th and 12th. 51 min: The fun and hot laps appears to be over for the Mercedes drivers. The fuel has gone in and both are circulating in preparation for Sunday's race. 53 min: Button goes eighth, 1m15.959s on the super-soft. 54 min: The super-soft tyre run didn't work out too well for Vettel. He was not able to nail one of his trademark stellar laps and he returned to the pits. 54 min: Vettel remains down the order in ninth position, some 1.255s down on Rosberg's leading pace. 55 min: Alonso currently has the best first sector time, with Rosberg fastest in sectors two and three. 55 min: Rosberg and Hamilton are 12 and 14 laps into this set of super-soft tyres. They are both lapping in the 1m20.5s bracket. 56 min: Massa comes in. He is currently fourth, just a tenth off Alonso. 56 min: Webber heads out for what should be the start of his long run on the prime soft tyre. 61 min: Perez's car is up on jacks in the garage as mechanics work on the rear of the McLaren. 62 min: Grosjean has reported low tyre temperatures for his off. 62 min: Hamilton's left front is beginning to look pretty second hand, while Rosberg is showing slightly less signs of wear on the same tyre. 64 min: Split strategy on tyres for Red Bull. Webber is running soft while Vettel is six laps into his super-softs and his pace is 1m20.384s. 64 min: Alonso now out for a longer run on the super-softs. He still looks like he is trying hard and is in the 1m20s. 66 min: Webber and Vettel both lapping in 1m20.4s The Australian is 15 laps into this set of softs while Vettel is eight laps on super-soft. 68 min: Rosberg is now running one second quicker than Hamilton on the super-softs of a similar age - around 23 laps. 69 min: However, Rosberg is suffering some overheating of the tyre surface, so is having to back off every few laps to keep the compound cool. 69 min: Raikkonen, like many of the quick guys, is now on a run with old super-softs. 69 min: But could this be the start of the cliff-face for Hamilton? 1m23.023s on the last lap from the Briton. 71 min: Vettel comes round at the end of a clear lap and that is 1m21.978s on super-soft tyres that have completed 12 laps. 72 min: At the back of the field, it is: Bianchi, Pic, Chilton, van der Garde. Bianchi is almost a second quicker than Chilton at Marussia, while Pic is around 0.8s faster than Caterham team-mate van der Garde. 72 min: Hamilton is back in the 1m20s range as his pace fluctuates. While Rosberg backs off again to cool the tyre after a lap of 1m26s. 73 min: Raikkonen is still lapping in the mid-1m19s despite being 15/16 laps into his stint. The Lotus looks good on short and long runs. 73 min: Pic pits after 18 laps on the super-soft. 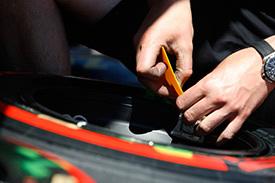 75 min: Rosberg pits, on the 26th lap for that set of super-soft tyres. He switches to the soft compound and heads back out. 76 min: Kimi on a 1m20.3 that time through on his ever-ageing super-softs. 76 min: Hamilton is still out there, 29 laps into this set of super-softs and he is still posting lap times under 1m21s. 78 min: Vettel completes a lap of 1m20.8s then 1m20.5s on super-soft tyres that have completed 17 laps. 78 min: Alonso still in the 1m20s on his long run. 79 min: Hamilton has pitted, got shot of those heavily-worn super-soft tyres and is now out there on a set of softs that have done 11 laps. 83 min: Rosberg 1m20.694s on his last lap on soft tyres that have done 12 laps, while Hamilton just posted a lap in the mid-1m19s. 85 min: Button's lap times are up and down a bit at the moment, 1m19s one minute, 1m22 the next. Fuel load and traffic making it hard to tell who is strong at this stage. 85 min: A lap of 1m19.0s then 1m19.272s for Rosberg on consecutive laps. His soft tyres have now completed 14 laps. 86 min: Less than five minutes of the session left and the drivers will get another two-to-three laps before the flag comes out. 86 min: Everyone is currently out on track, except for Grosjean of course. 87 min: Kimi has changed to the soft tyre now. 88 min: Another lap in the low 1m19s bracket for Rosberg, who has now completed 16 laps on his soft tyres. 89 min: No change of tyres for Vettel and he has remained on the super-soft for the duration of his high fuel run. 24 laps on this set of tyres. 89 min: Vettel's last lap was 1m19.860s and he comes round again in 1m19.946s. 13:30 The session has ended. Drivers already on a timed lap may complete it. 13:31 Raikkonen managed a 1m18.219s at the end there after three laps in the soft, but unclear how many laps his tyres had done in total. Looking good for Lotus though. 13:31 The drivers have taken the flag and they are heading back round so that they can return to the grid and practice some starts. 13:33 Rosberg didn't quite get the start he wanted, having been faced with too many cars in front of him. 13:34 He had to abort and tour through the middle of the grid, without getting a practice launch. 13:35 But nevertheless, it's Rosberg who tops second practice at Monaco with a time of 1m14.759s, three-tenths ahead of team-mate Hamilton. 13:36 Alonso is third for Ferrari, with his team-mate Massa fourth, Webber fifth, Raikkonen sixth and Grosjean seventh after his crash. 13:36 Button ends his day in eighth spot, ahead of Vettel ninth and di Resta rounds out the top 10 on a sunny and warm day in Monaco. 13:37 So it's the Mercedes pair looking good again so far ahead of the Ferrari drivers. Join us tomorrow for final practice and qualifying.